The baby stroller is the essential equipment for moms who have little kids, infants or twins. From the time you welcome a baby, a stroller is the most needed item till 3-4 years and you can’t think a single day without a stroller if you love to go for a walk or shopping with your loving kids. Sometimes you may use it until your kids grow up to 7 or 8 years. If you are the parents of twins then you must need lots of help and if you’re the first parents of twins no doubt you need special help. To select a right stroller for your twins is most important because the whole day you are not going to sit at your house. It can be more or less but obviously, it is amazing to think about an outing with your new babies and you want to make sure their safety and comfortable ride. As the parents of new babies, it is not a very easy task to find the perfect stroller that fits you and your baby’s needs. While choosing a stroller you need to keep in mind that you’re both kids can enjoy all rides with maximum comfort. Some parents get really upset while they are trying to find a perfect fit stroller for their lovely twins. If you are going to buy a stroller, you will see lots of guidelines available to you to go thru. When you have twin babies and going to buy a suitable stroller for them at that point you need to follow a few steps. There are a few factors such as age, weight, safety, location, lifestyle, and capacity etc. to consider before buying a stroller for your twins. You are a mom of twins baby and struggling with a stroller every day and it cannot move everywhere easily that can make your daily life miserable. It can be a big problem if you have a very active life like you go to walk every day morning or evening and you do your regular grocery shopping with your babies. At the time of your buying, you need to ensure that you buy the stroller that can be folded, open easily and it takes less space to store. Compact strollers take quite less space and easy to transport from here to there. Safety and comfort are the first priority for your babies. I think you are going to buy a stroller with lots of security and comfort features like seat reclining in multi-position, weather protection and 3 to 5 point harness straps etc. Well, don’t worry I am going to summarize the details of some best strollers for twins, which will help you to take the right decision according to your needs. Maybe very often you love to go out with your kids and you must be going to use the stroller most of the time so you need to choose a stroller which is lightweight because you need to push it always and you need to lift it in the car then bring it back to your house. A heavier stroller can be a reason for your muscle pain and backache. So, lightweight strollers are always better. To going out with your newborns for the first time can be a reason of your stress since you are really concerned about your babies and you don’t want to hurt your babies and any missteps in any way. Don’t take too much pressure this article will help you to find the best stroller which will be the perfect fit for your twins. You should use a baby carrier for your kids while going out until they can hold their heads without any support. If you have a car and you go out with your twins in the car then you must choose a stroller with car seats for twins. You should find a stroller for your twins for long-term use not only newborns. 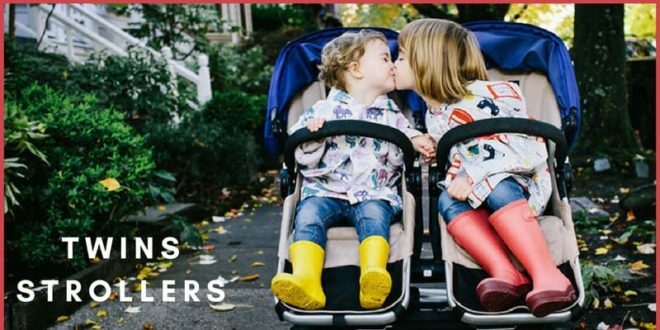 While you are buying a stroller for your kids you must think about the protection of your twins from natural climates like rain, sun, and heavy wind. The umbrella stroller with large canopy is a good choice for you. So an umbrella stroller can be a perfect option for you. Find your perfect double stroller for your twins and you can enjoy the storage facilities. Hope this article will help you to find the best stroller for your kids. Are you very active in your daily life? If you love to walk or jogs every day then you should go for a jogging stroller. 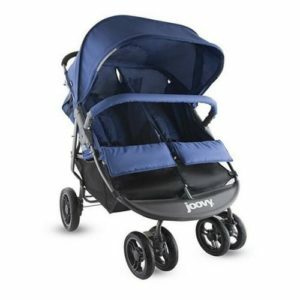 There are very rear jogging strollers are available on the market and exclusively those ones which are made for twins. The jogging strollers come with durable big wheels. The three wheels strollers are good for jogging with these wheels you can run on tough terrains and bumpy street smoothly without any trouble. And it can give the best experience of jogging. 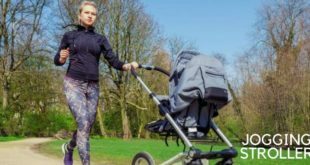 According to customers’ review, cheap jogging strollers are not good enough and it won’t give you full satisfaction. Don’t get me wrong because it doesn’t mean cheap means always low quality but in some cases, it matters. In this article, we have picked some top rated strollers in the market for twins. I strongly believe that this article will guide you to take the right decision. I think it’s not very easy to find a sustainable stroller. To take the right decision for your twins you should have enough knowledge about it and you need to know how many varieties are available in the market. The following features are important while you are buying the best stroller for your precious twins. There are huge varieties of designs to choose from. We will find a lot of safety and comfort features for your kids. They come with a reclining seat with multiple positions, huge storage space, a big umbrella, safety harness straps, padded seats, drinks holders. The standard strollers come with heaps of features with the range of reasonable to high-end. The most of the strollers equipped with lightweight, durable metal and designed to fit with specific seats for newborns. Normally the car seats get removed from the main part and then it’s come apart from the frame and you can set the car seat into it to go out. If you don’t want to go out very often while your infants are sleeping then you don’t need to have these. In these strollers, the frame folding is quite easy and takes small spaces so you can carry it to your car trunk. The time your baby weight is 35 pounds for each you don’t need to use car seats anymore. Mainly the umbrella strollers are the lightweight stroller. These are compact and easy to fold. These strollers maximum weight is 12 pound or less. But in reality, these strollers come with less padding. These are good for older kids and toddlers because most of the umbrella strollers don’t decline entirely. The Jogging strollers come with large three wheels. These are strong enough to move on rough terrains and frames are lightweight. It is easy to push and comfortable for both baby and the pusher. These strollers are smooth to ride for long distance while you are running or jogging. For babies, under 6 months you should buy some extra kits to increase your baby’s safety. In these strollers, baby can push two babies at the same time. You can change the sitting style. Sometimes front facing or sometimes face towards parents. These are actually tandem styled strollers. Some side by side strollers can be used as a triple stroller by adding a standing platform. According to customers’ review, most of the people like tandem style strollers because they can pass through all doorways easily. In some cases side by side strollers difficult to manage in the busy public area. After complete research, I have picked some best strollers for your twins, which can be perfect for your kids. The Baby Jogger City Select is an amazing stroller which is very popular because it has excellent features such as it can be transformed from a single stroller to double stroller with extra bassinet, car seat adapter or an extra seat. It can be featured with 16 varieties of seat combinations. Actually, this is great. It also comes with a large canopy, big giant storage basket, and an easily adjustable handlebar. It is a stylish, good-looking, modern design and innovative stroller. The transform option from the single into the double stroller is a unique feature compared to other strollers. Most of the side by side double strollers with both seats are very wide and quite difficult to manage in busy public places. In spite of having the name with Jogger, it is not a jogging stroller. This is designed for regular use like going shopping, walking around, enjoying the beauty of the park etc. It is one hand stroller and single mode weight is 28 pounds and double mode weight is 34pounds. It comes in plenty of colors variety and in fact, it has a big choice of car seat adapters to choose from to mark it as a travel system. This is really an amazing stroller for your kids of your growing family. The Chicco Cortina is one of the famous brands for single traditional stroller maybe you already heard that. Similarly, the double stroller from Chicco Cortina is also an excellent stroller for your little kids. It comes in a tandem style which is called Chicco Cortina Together Double Stroller. In this stroller, you can get 4 different seating combinations. So you can use it for different age children, twins and infant to older babies. You can use 2 infant car seats in this stroller by making it to Chicco travel system. If you have two older kids you don’t need to add any infant car seat. You can use the front and rear seat. If you have different age children such as one newborn and the other one is an older kid then you can use only one car seat. You have four different options you can use according to your requirements. This stroller is comfortable for your little champs. It has two padded seats with independently multi-position reclining options. It also features with easily removable and adjustable canopies. The front seat comes with drinks holders for your kids which is interchangeable and a padded armbar. It has a zipped access storage basket to keep all your baby’s essentials. This stroller is easy to manage and it has one hand active system so you can fold it easily just using your one hand and easy to store and maneuvering at any place. Also includes 2 drink holders parents and storage space on the tray for small items such as key, phone, snacks etc. The 3 positions adjustable handlebar comes with a pad which is comfortable for parents and the toe-tap braking system make a secure parking position. The ScooterX2 double stroller is a new and stylish stroller. It can make your trip special for you and your beloved little ones. This stroller is fit enough to pass through most doorways. It has wheels with a quite large sealed bearing which give your kids a smooth and comfortable ride. The individual reclining seats can be set in various positions and two massive sporting canopies to protect your kids from sun, rain and heavy winds. The Joovy Scooter X2 has the largest storage basket so you don’t need to be worried to take all the belongings with you for your both kids. It provides ample space to take everything you need for babies. The stroller has two handy cup holders for drinks and two zipped lock pockets to protect your belongings. 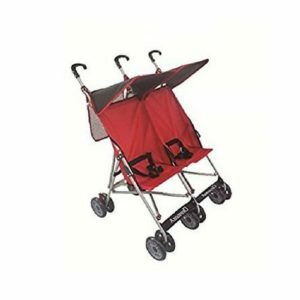 This stroller featuring single-hand folding and can be fitted with any trunks, cars easily. It is suitable for your twins while traveling outside. This stroller makes your strolling experience comfortable, exciting and real fun with your both kids. 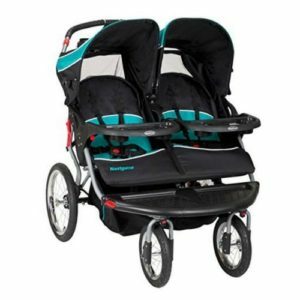 The Scooter X2 is a side by side double stroller with plenty of features and great value. This is perfect for same age siblings or twins anywhere. 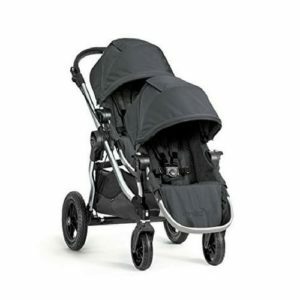 The Baby Trend Navigator Double Jogger Stroller is comfortable and can navigate in any crowded public area easily. You will love the unique play music feature of the stroller. You and your kids can enjoy the music while strolling. This is the stroller you are looking for. It is perfect for twins or same age kids. 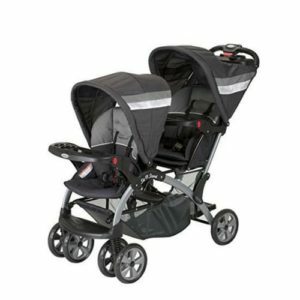 The baby trend navigator double stroller is loaded with lots of features. It comes with two front wheels which make the maneuverability easy and smooth. 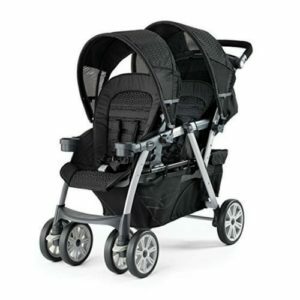 The baby trend navigator double jogger stroller can ensure a safe ride for you and your kids. This stroller is easy to move and turn. It also can take two newborn car seats to convert into a travel system. This stroller is very stylish and reliable. It has two designs variety so you can grab your preferred one easily. One is called Tropic- blue, green and black the other one is vanguard – gray with orange lining. Both designs look great. This is a side by side double stroller. The baby trend is not very small stroller and the weight of the stroller is 43 pounds and it can take 55 pounds for each seat from 6 months kid. The stroller is compatible with infant car seats so can be used for the newborn as well. Parents are recommended not to jogging with newborns until they become up to 6 months old. The baby trend navigation double jogger stroller comes with padded seats so your kids can sit comfortably while riding on it. The double stroller comes with a footrest so your kids can place their feet and enjoy the ride. The front wheels of the stroller come with lock swivel wheels which make the ride comfortable over rock and rough terrains. The Baby Trend Navigator Double Jogger has an easy to use foot brake that you can use while you are parked and your kid’s stroller stops in place. The Graco DuoGlider Click Connect Stroller, Glacier is a perfect double stroller for your growing family. It has all the simple and basics that needed for your loving kids. This is a lightweight double stroller which contains lots of features. It has an amazing style of seats, so the rear sitting baby seat is slightly raised so that your baby can enjoy the beauty of the view. Both seats have the reclining system to keep both travelers comfortable and enjoyable. The seats of stroller feature with kid’s tray for each seat to keep food, snacks, and toys and drink holder as well. It also has a parent’s tray, footrest and rotating cover. The extra-large storage basket allows you to take all necessary items of your kids and it has the one-hand folding system. The DuoGlider Click Connect stroller also can accept two Graco baby car seats. It is a perfect double stroller for your kids. It is durable, lightweight, easy to push and comfortable for your kids. This stroller is easy to fold, manage and assemble together. It can be fit for any doorways. Are you struggling with your old stroller for your twins and looking for a perfect one? Don’t worry we have some great news for you. We are here to describe shortly a double stroller so that you can decide to buy and make your little ones feel special while riding in the stroller. The Amoroso Twin Baby Stroller is one of our best choices for kids. It is a reasonably priced stroller. It has a great response by most other users. It’s a heavy duty stroller but weigh light. While you are carrying you 2 kids in the stroller it is easy to manage and you don’t need someone else to help you. The baby stroller has 3 point harness for your kid’s protection. This is easy to maneuvering but good durability. The stroller has the maximum capacity up to about 55 pounds of weight. It is suitable for up to 2 to 4 years aged kids. This Umbrella styled twin stroller has larger wheels in the size of 6″ x 12 and the front wheels can rotate 360 degrees which provide a comfortable, smooth ride for your darling kids, it has the brakes at rear wheels. At present The Baby Trend Sit and Stand Double Stroller is one of the famous brands in the market. With its reasonable price, well build and good design the stroller become the first choice for parents who are looking for a sit and stand double stroller. The baby trend sits and stands double stroller, is by design the only stroller with a standing platform, which can suit all your requirements as a busy parent. With the facility to accommodate two children, you can walk with them around the city without any trouble. You might be thinking how but all the features come together with it are the answers. This sits and stands double stroller can take two baby trend newborn car seats which will be fit perfectly in the child trays without any adapter to join. It features with single hand folding system which makes it very easy to manage. It comes with a detachable child tray which contains a drink holder. There is also has a parent tray with 2 drinks holders. Finally, the above-listed strollers are established the best stroller for twins. It can be a tough decision for you to find the best stroller for your kids. But if you survey all the guidelines defined above, it will be easy to pick one that suits your twins with comfort and security. Maybe some negative reviews are not correct always, so don’t agree with negative reviews or price tags as a threaten you. 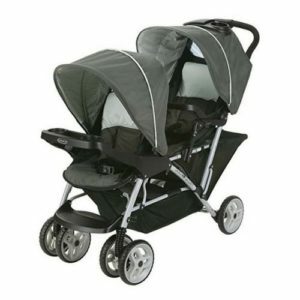 So these are some best strollers for twins which you can choose to buy. I think this article will help you to find the best stroller for your kids which suit your requirement.